Cardiff Blues old boy Casey Laulala returned to thwart his old club as his late try earned Munster just their second away Pro12 win of the season. The New Zealand centre sprinted onto Ronan O'Gara's pass and escaped Tom James's tackle to condemn the Blues to a sixth successive defeat. Tommy O'Donnell gave Munster a lead and Dafydd Hewitt's try then gave the Blues hope before O'Donnell scored again. Lewis Jones thought he had given Blues victory before Laulala's late winner. The 30-year-old, who scored 15 tries in his three years at the Blues, joined Gethin Jenkins in the Arms Park exodus in summer when he signed for Munster. And Laulala came back to ensure Munster continued their dominance over the Welsh region with a fifth consecutive triumph over the Blues. The Irish province took advantage of poor defending as all three Munster tries were as a result of missed tackles to pile more pressure on coach Phil Davies, whose Blues are on their worst run since January 2005. However the side, without Wales stars Sam Warburton, Jamie Roberts and Leigh Halfpenny, did at least pick up a losing bonus point in a performance that was an improvement on recent thrashings. And the Blues, who lost skipper Andries Pretorius to a rib injury at the 11th hour, started brightly as Jason Tovey scored an early penalty, although he had missed one earlier from the touchline. Munster, though, went ahead after spreading the ball across the field, Ian Keatley's neat offload setting number eight Donnell over in the corner for a simple score that O'Gara converted. Munster, also weakened by international calls, did have O'Gara available but the Ireland fly-half was sin-binned after a quarter of an hour when he illegally prevented a Robin Copeland breakaway. But Munster survived their spell with 14 men after Cardiff missed an overlap following a kick-and-chase by full-back Dan Fish. O'Gara returned with a simple penalty to extend the visitors' lead before the break but the Blues were level six minutes into the second half. Ceri Sweeney replaced the ineffectual Tovey at fly-half and, with his first touch, fed centre Dafydd Hewitt, who burst through to touch down before former Wales fly-half Sweeney converted. Sweeney then slotted over a straightforward penalty but the home side's lead was short-lived as O'Donnell smashed through a weak tackle by Copeland and Campese Ma'afu to score under the posts, allowing O'Gara an easy conversion. O'Gara's long-time Ireland half-back partner Peter Springer did not enjoy such a fruitful night as the second-half replacement had a kick charged down at the base of a scrum which the Blues capitalised upon. Lou Reed stopped Stringer's boot downfield and Blues scrum-half Lewis Jones kept the ball alive to score in the corner, although Sweeney's conversion drifted wide. 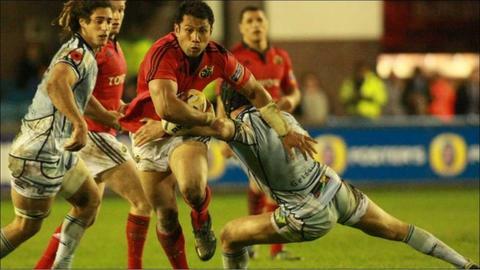 Just as Blues fans were preparing to celebrate, Laulala evaded James's weak tackle to score his first Munster try against his old club. Cardiff Blues: Fish, T. Williams, Evans, Hewitt, James, Tovey, Jones, Ma'afu, R. Williams, Filise, Reed, Down, Hamilton, Navidi, Copeland. Replacements: O. Williams for T. Williams (58), Sweeney for Tovey (44). Not Used: Kyriacou, Hobbs, Harford, Cook, Young, Lewis. Munster: Jones, Howlett, Laulala, Keatley, O'Dea, O'Gara, Williams, Horan, Sherry, Archer, D. Foley, Holland, D. O'Callaghan, Dougall, O'Donnell. Replacements: Stringer for Williams (53), J. Ryan for Horan (62), Butler for Dougall (34). Not Used: Varley, du Preez, Nagle, Barnes, Murphy.